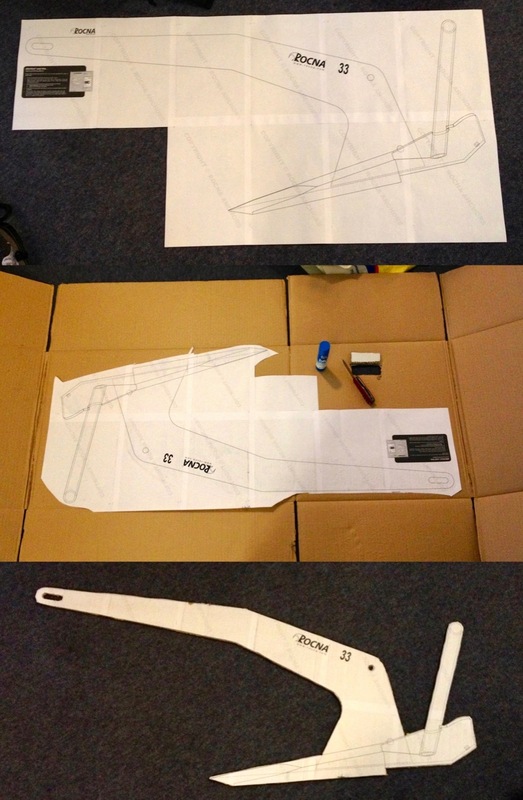 Cardboard anchors are very helpful in determining the largest anchor you can possibly fit on your bow roller. 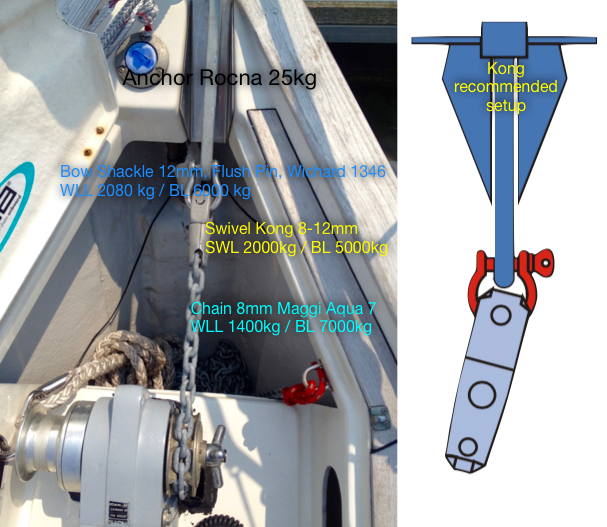 Our Anchor is a Rocna 25kg, one size larger than suggested for our boat, which is the way we like it. Since we don't like paying for marinas, especially during the in many places overpriced summer season, I decided to invest in some top notch anchoring gear. As part of it, I wanted some good, strong chain, and high-tensile 8mm chain was the obvious way to achieve that without going up a size to 10mm, which would've meant a lot more weight (or less chain length) and another grand for a new windlass gypsy. The best price for Grade 70 (high-tensile) anchor chain in the UK was a lot more than shipping from Italy, so I ordered 70m of 8mm DIN Aqua 7 chain straight from Maggi. We paid €838.90 total, including a €174 shipping charge to have it delivered to Brighton Marina. This was a few hundred less than from a UK chandlery. Alas, whoever was attempting to deliver it the first time couldn't find Brighton Marina (quite a feat) and then amazingly the chain was actually returned to Italy without bothering to contact me or anyone else at the marina. Who does that! So the chain was ordered April 5, shipped May 19 and finally arrived on June 5, a full two months later, at which point it was the last item keeping us from departing Brighton for good. We saved some cash, but lost some time. The connection between chain and anchor is very important. This chain has a WLL (Working Load Limit) of 1400kg and BL (Breaking Load) of a whopping 7 tons. Maggi does offer some oversized links for the ends, as finding connectors that match the strength of G70 chain can be difficult, but these cost extra and have the major downside that you cannot just cut off a few links from the end of a chain, which is often where wear and corrosion occur first while the rest is still good. So I didn't want those oversized links, instead using a Kong swivel, which has a titanium pin that fits a regular 8mm link and matches (exceeds) the WLL of the chain. To prevent the swivel from jamming in the anchor slot, there's a 12mm Wichard bow shackle with a flush pin between the swivel and the anchor slot. This is also appropriately rated, and wasn't even that expensive (for Wichard kit) in a French chandlery. Both the flush pin shackle and the Kong swivel are secured with Loctite. Spraypainting the new chain. Note flying hair and waves. The chain was thickly galvanised when it arrived, and we painted it with neon yellow spray paint after a quick rinse and scrub with a nylon brush. 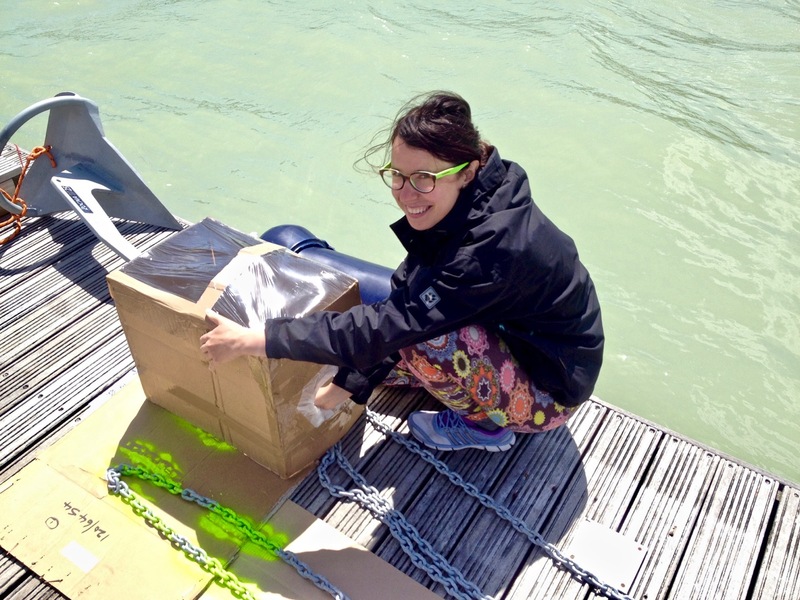 As we were in a hurry to leave, we had to improvise a spray paint box from cardboard, with a clingfilm window at the top, a plastic bag taped into a hole for a glove and a lot of packing tape holding it all together. This allowed us to spraypaint in a near gale, so we could leave as soon as the weather calmed down a bit. Yellow is the best colour for this, as it's highly visible underwater, in low light and in the red light of a headlamp at night. How to mark chain so you don't need a decoder ring taped inside the lid of your anchor locker. The way we mark this chain is with a dash and dot pattern. A dash is about 5-7 links, a dot is 3 links. Every 10 meters is a dash, so there's one dash at 10m, two at 20m, four dashes at 40m, etc. And the 5m between them have a single dot, all of them. So two dashes and a dot are 25m, and four dashes and a dot 45m. 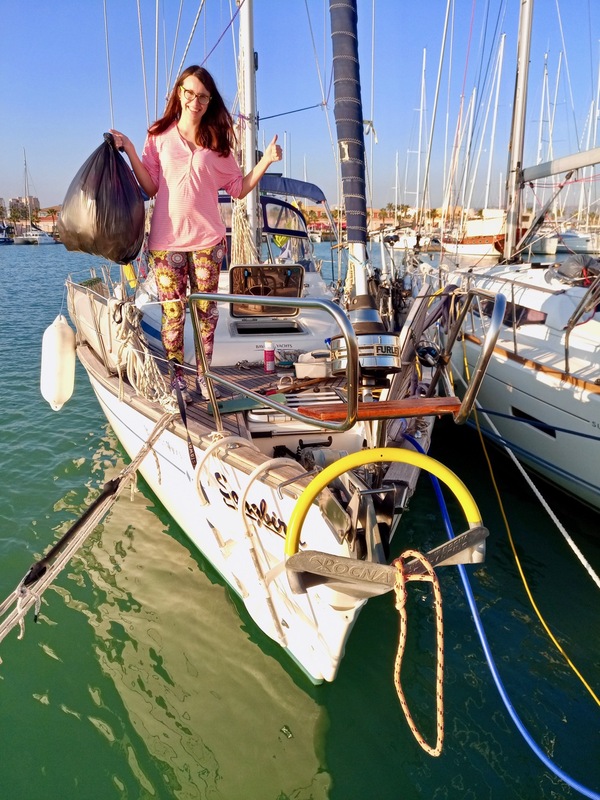 Easy to remember and easy to spot even when the chain is rattling out with the windlass brake open and the boat being blown backwards as we lay the chain (this is important - you mustn't try to put load on your Rocna before having sufficient scope out). 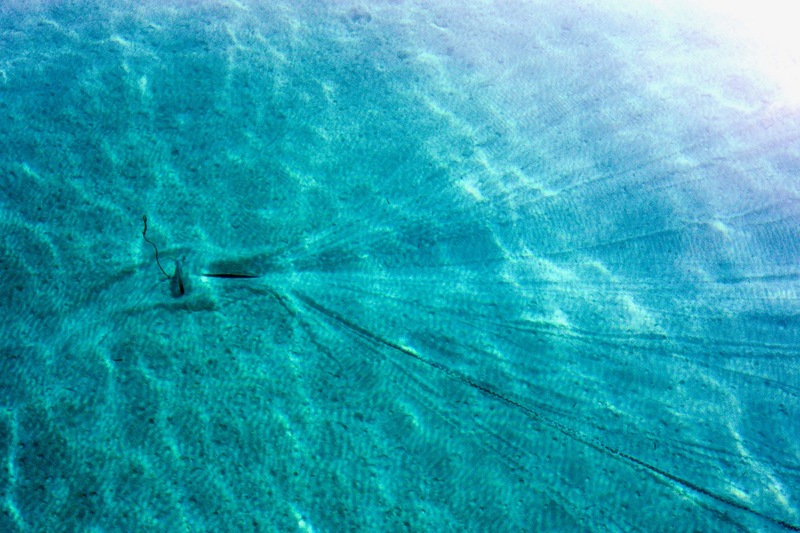 Anchor set in short distance and chain sweeping sand as we swing. This is where the zinc gets sanded off. The chain gave us no troubles, but started to change colour during the second season, with the most used 30-40m turning darker and smooth. There was no rust yet at that point, although it was clear the zinc galvanising was beginning to come off. I suspect this is more from abrasion than from chemical processes, especially as it seemed to happen more quickly while anchoring in the lovely sand of the Islas Baleares. The worst part of the forward half. Also a section of the less used part for comparison. 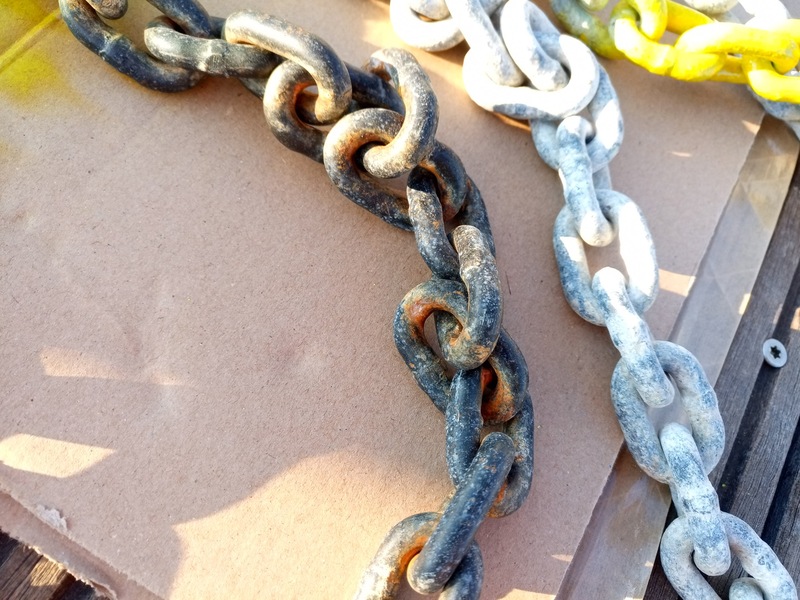 After a full two seasons of spending a lot of time submerged and sweeping the seafloor, there is now some light rust on that first half of the chain, restricted to the high-wear area where the links touch and rub against each other. It's not too bad yet. We probably should turn the chain around, so the other half gets used more instead (which is still whiteish/grey with the galvanising intact), although I didn't think of that until after we refreshed the paint markers. So it'll get turned around next year I think. Apparently you can get G70 chain regalvanised (at which point the yellow paint must come off completely), although I haven't looked into that yet, and I'm not sure at what point in its life it is best to do this. There's no detectable loss of thickness of the chain links yet, but many of them are unprotected now. I'm also wondering if a riding sail that reduces sailing around at anchor won't make the chain last a bit longer, as it would do less sweeping along the seafloor. It's on the long end of the todo list somewhere. This winter the rollbar of the Rocna also got some yellow paint, to make it easier to find while diving in thick seagrass.